In a saucepan, cube entire brick of Velveeta. In a skillet, brown the Breakfast Sausage, and Drain. Place saucepan under Medium heat, and slowly melt the Velveeta Cheese. Add 1 Jar of Salsa-Holics Salsa. Stir frequently, until Cheese is fully melted. Add Ro-Tel, and stir. Set Browned Sausage aside, do NOT mix with Queso, yet. If too thick, Add more Salsa-Holics Salsa. 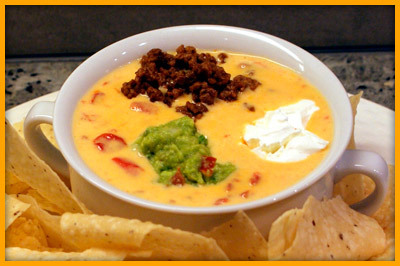 Once everything is mixed evenly throughout, pour Queso into a slow cooker or Croc-Pot under LOW setting or WARM. This should allow the queso to maintain a consistent temperature during the game. Stir occasionally. Mix All Ingredients Together prior to Scooping the Chips into the dip.